Why am I talking to you about a stand alone toilet paper holder? An incredibly oddball topic, I know. Short on time? Click here to find this toilet paper stand with a pivoting bar on Amazon. In the wall right next to this toilet paper holder was a hole – sort of. It was pretty obvious that the guys that built the bathroom initially put it too close to the toilet, and moved it just a little further out. But instead of filling in the hole, they just ran wallpaper over it. So, you had wallpaper over this hole in the wall. Now, tell me, what little kid would NOT want to poke a hole into that wallpaper to see the treasures that MUST have been hidden behind it? And imagine the frustration when my parents forbade the poking of any holes in wallpaper especially in bathrooms where there must be hidden treasure. Now, I am having my own bathroom redone. Do I want the contractors to put a hole in the wall for a toilet paper holder? And considering that there is beautiful white subway tile wainscoting in this new bathroom – well drilling holes into the tile will never do. I was in search of an alternative to the traditional, wall mounted toilet paper holder. Luckily I found an awesome solution. A freestanding toilet paper stand on Amazon. At first I was going to run to Bed, Bath, and Beyond to pick up just anything. But I am so glad that I took few minutes to search Amazon before running out the door. Because the stand alone toilet paper holder that I found has a really awesome secret. In fact, the fixtures I chose for the shower and sink were from the Moen Voss collection – in chrome. 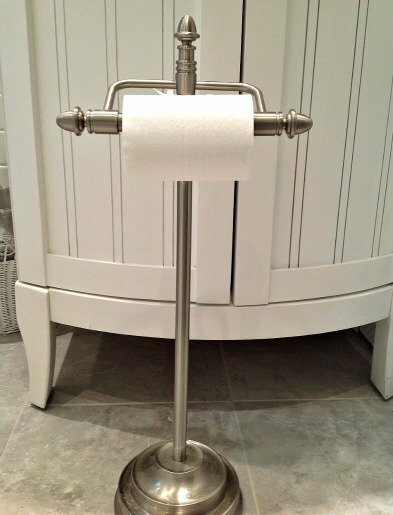 And this toilet paper stand was only available in brushed nickel at the time (although now I see that it is available in chrome). It didn’t even match my decor. 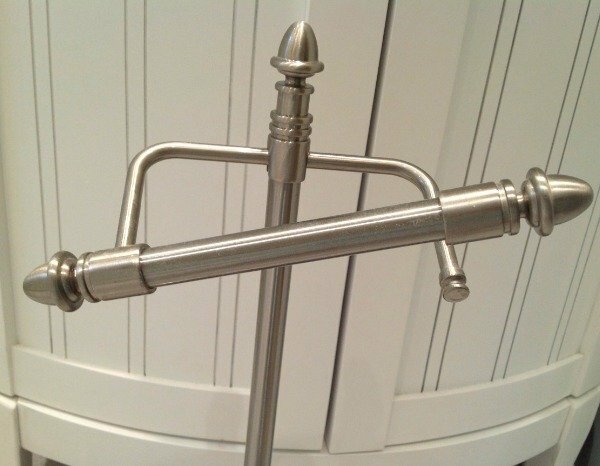 So why did I choose this particular stand alone toilet paper holder? Well, this site is Almost Practical after all, and this decision was entirely dictated by my practical side. Don’t deny it – we all know what a pain it is to replace a roll of toilet paper. That spring loaded bar thingy never sits right on the first try. And often it pops right out. Not only that – I have actually had a few break apart. Searching for springs and plastic parts that are strewn about and then assembling the darn thing is hard enough under regular circumstances. But when it catches you with your pants down, literally speaking … yeah, well. And forget it if you have kids. Small children may not be able to change those spring loaded bars on their own – and teenagers can’t be bothered. 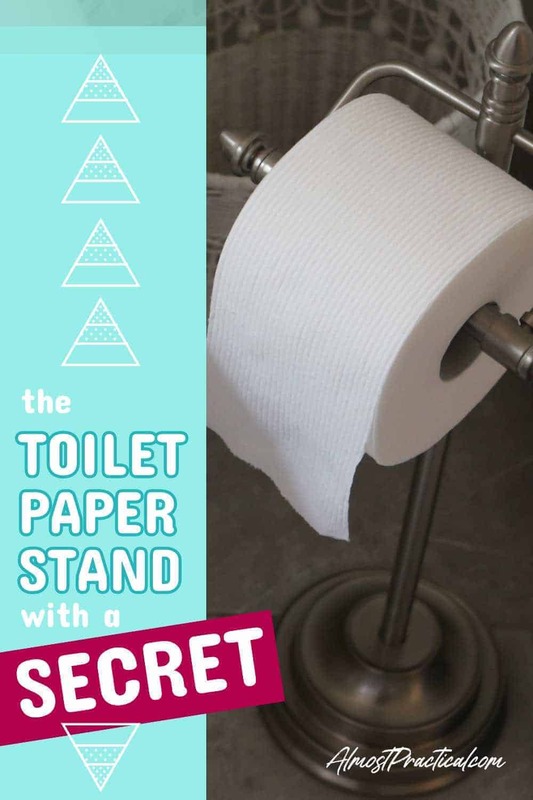 This free standing toilet paper holder has an incredible secret. This toilet paper stand has a flip up hinged bar. It pivots! 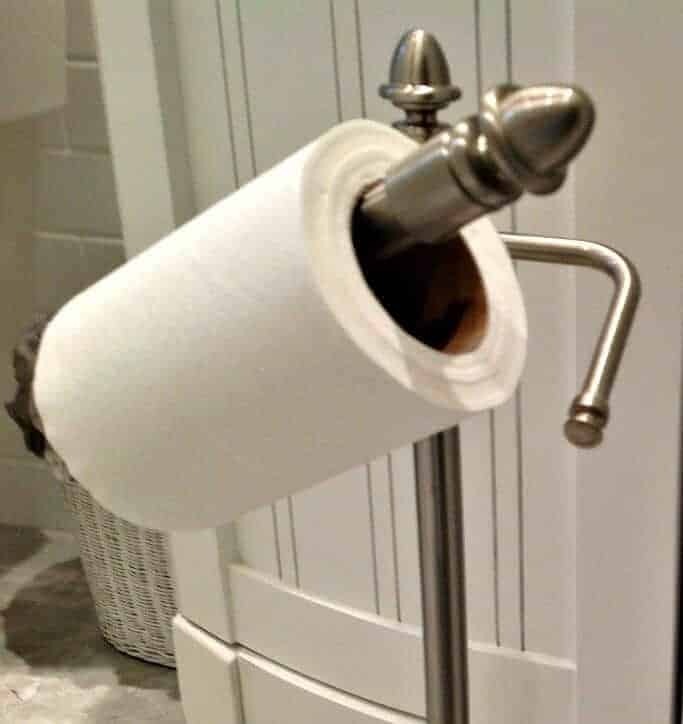 To replace a roll of toilet paper all you need to do is very easily lift one side and slide off the empty tube, then slide on the new roll. I call it the civilized way to change a toilet paper roll. This model is from the Moen Stockton collection and you can find it at Amazon.com here. Update: I have noticed (because I have nothing else to do but follow the availability of a toilet paper holder on Amazon) that this item is not always available. It seems to come and go. I will keep an eye on it – and if I see something better come on the market I will let you know. Have You Remodeled Your Bathroom Recently? What funky thing did you come across that you can’t live without? Now that our bathrooms are done – we embarked on a new project: A Kitchen Renovation. Maybe we are just gluttons for punishment, but it will be nice when it's done! Window in a shower? Read my thoughts about obscured glass here. How high should wainscot be in your bathroom? Using glass tile as an accent in your shower.